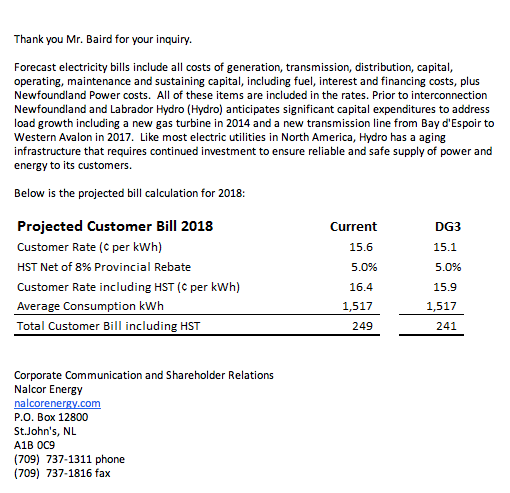 "I understand that Nalcor is estimating that the new cost estimates will result in a $8 higher monthly power bill for the "average" customer. I would like to see the analysis that derived the $8 figure from the new cost estimates. Is that possible?" The email is a bit short on details. I would have liked to see how the burden is spread between residential users vs. industrial users, what the projected customer rate is in future years, and how the various parameters (projected fuel cost, interest rates, etc.) have changed since DG3. I think this email clarifies matters a little bit though. One interesting observation: they seem to assume that the higher price will have no effect on average consumption. Do they take price elasticity into account in their long term forecasts? 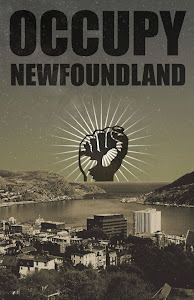 Correct me if I am wrong, but I think the current before-tax rate for residential customers in grid-connected Newfoundland works out to an average of about 12.2 cents/kWh. If that is correct, then the increase between now and 2018 will be 29% (15.6 / 12.2) or a compound rate of increase of over 6% per year.